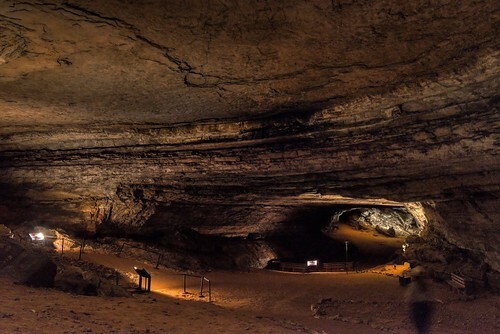 An image captured along the Audubon Avenue inside Mammoth Cave in the national park. With this image, I wanted to capture the immense feel of the caves all around me in this giant canyon passage. I did my best to minimize some of the information exhibits around, but I also felt that was kind of important as it did give a sense of perspective that was really needed. A park ranger happen to be walking by, so I captured part of the shadowed image of her moving by me. I kind of felt that added to the perspective for this image too. While I was satisfied enough with the image, I decided to try another approach to post-processing and import the RAW/NEF image into Aurora HDR 2019 to see what it might produce. I found it brought out much richer and larger dynamic range to the image. I then exported a TIFF image to Capture NX2 where I was able to finish up for this final image.